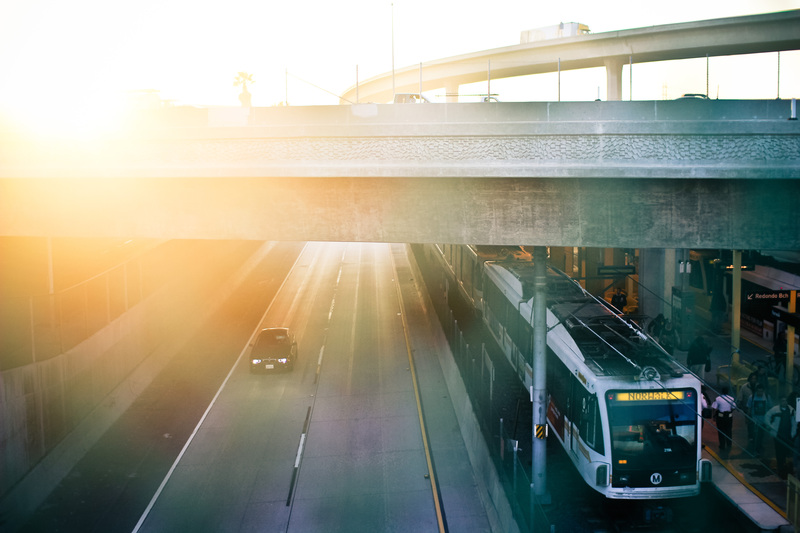 ART OF TRANSIT: Very nice photo of the under-photographed Green Line, which runs mostly down the middle of the 105 freeway. Photo by Matthew Grant Anson, via his Flickr stream. The fare increases and changes approved by the Metro Board in May will begin on Sept. 15, a couple weeks behind the originally targeted date, reports Joe Linton. At that time, the regular fare will increase from $1.50 to $1.75 and also include two hours of free transfers. The cost of regular daily, weekly and monthly passes also increases — meaning that riders really need to consider whether it’s a better deal to pay per trip or still purchase a pass. Students who pay the discounted cash fare — which will not increase — don’t get the free transfer, according to a Metro staff report. The Senate and the House continue to bicker over a short extension of the federal transportation funding bill. The House has a plan to keep it limping along until May, the Senate wants to shorten that time until December and get rid of some financial tricks — such as “pension smoothing” — that would keep the Highway Trust Fund from becoming an empty balloon. Long story short: neither bill really tackles the main problem, which is that the federal gas tax — which hasn’t been raised since 1993 — doesn’t cover the nation’s transportation funding program anymore. In its ongoing studies of the Palmdale-to-Burbank segment of the bullet train line, the California High-Speed Rail Authority will study a tunnel under the San Gabes in addition to a route that largely follows the 14 freeway. The tunnel would be a more direct shot but, presumably, would come at a higher cost. It currently takes Metrolink trains about two hours to travel between Union Station and Lancaster — that’s a two-hour train trip that never leaves Los Angeles County! Columnist Steve Lopez gets the bat squarely on the ball in a column that efficiently chronicles the difficulty in getting a curb painted red in a no parking zone and a certain major utility letting its sprinklers run all day in a drought before….just read it. Peter Rusch isn’t too thrilled with spandex-clad cycling groups that run stop signs, saying he doubts they would behave that way if behind the wheel of a car. No doubt there are some cyclists who flout the law. And that’s wrong. But pleeeeeeeease. There’s equally no doubt it would easy to write a column every day about motorists who blow through red lights, stop signs and who illegally nose their cars into crosswalks — and who far outnumber cyclists on the road. Free wi-fi will be available on 14 commuter rail lines in the Greater Boston area, including some stations. A contractor is installing it for free — they hope to make money by getting people to pay $15 a month for premium wi-fi that would allow customers to stream video. Puhleaze. The only reason Mr. Buch won was because the issue was reported in the LA Times. Otherwise, government agencies would just brush it off because they’re too incompetent to do their job that taxpayers expect them to do, just like those who work for Metro. How the city looks on the media is important than what the taxpayers demand from their municipal government. 2. Daily, weekly, and monthly passes are still the norm instead of implementing a cap system. 3. Student fares will remain the same but don’t come with free transfers. Does Metro expect people to remember all this? Time to write and publish a “How to Ride Metro for Dummies” book! Of course, the rest of the world is simple as just tapping in and tapping out and charging riders based on distance. 1) Will you be able to make several trips on the same line, and in the same direction, within the 2 hour window? For example, If i take the 720 Westbound from Downtown, and get off for a quick errand in Koreatown, will I be able to board another Westbound 720 within the 2 hour window and complete my trip to Westwood with a single fare? If not, what if I board the 720 for the Downtown-Koreatown leg, but then the 20 from Koreatown to Westwood (again, within the 2 hour window)? 2) I understand roundtrips on the same line will not be allowed with a single fare within the 2 hour window. However, what if I take the 720 westbound (let’s say from Downtown to Koreatown) and then return on the 20 eastbound, back to downtown, within the 2 hours? Technically, this is still a round trip, but on 2 different lines. If this won’t be allowed, what about boarding a closely parallel route for the return trip? For example, taking the 720 westbound from Downtown to Koreatown (along Wilshire), then returning eastbound back to Downtown on the 18 (along 6th Street, 1 block away). Would this be allowed within the 2 hour window with a single fare? Very good questions. Others have asked similar questions. I’m hoping to post a Q&A that answers this fairly soon — and also tackle other aspects of the fare changes. Hang tight please. I want to make sure we answer correctly. After the previous post about transfers, I was confused about whether the transfers were only valid in a single direction, and, if so, what that meant practically. Has that been cleared up? If I take the expo line from downtown to culver city, can I then take it back for free? Can I take the 733 east to downtown as a transfer? You would not be able to take the same line round-trip on a single fare. In other words, you can’t take the Expo Line from Culver City to Expo Park and then board an Expo train back to Culver City. As for the 733 part, let me check. As I posted below, others have posed similar questions and the agency is working on a Q&A that will hopefully answer everyone’s questions. I haven’t been fully briefed on this yet so I don’t want to lean too far into the wind and provide a wrong answer. Please hang tight and I’ll try to get the info up soon. The absence of transfers for students results in a silly situation: a student who needs to transfer is better off paying the regular fare ($1.75) than the student fare ($2.00, or even $3.00 if two transfers are required). So now a student needs to carry two TAP cards — their personal student card for trips without a transfer, and an adult card to use on trips with transfers. It would have made much more sense to make student transfers available for 75c, and build this functionality into TAP (so a second tap within 2 hours would deduct the transfer fare, and any subsequent taps within the same 2 hours would be free). If the tunnel is built for the HSRL, Metrolink needs to contribute to get its lines to travel through the tunnel too. Regarding Metro’s plan to raise fares, Salon’s new article suggests doing the opposite — Listen Up America: It’s Time to Start Making Mass Transit Free! What’s the point of installing a limited WiFi service and end up paying $15 a month for WiFi on a commuter train when most people these days have data plans on their smartphones with tethering capability that allows a person to access high speed data everywhere? Alternatively, one can also get a free portable MiFi device from Karma (https://yourkarma.com/) or FreedomPop (http://www.freedompop.com/) which provides you with free wireless data per month with absolutely no hidden fees. Technology is moving faster and the cost of it is getting cheaper everyday. Why spend money when you can have the same thing for free? Not to mention the possibility of Amtrak’s San Joaquin corridor once again serving Los Angeles without that insanely long bus ride between Union Station and Bakersfield. Steve, I wonder if you can possibly get information on the following. As you write above, the Metro staff report on the fare increase says that students paying the discounted cash fare will not benefit from the free transfer. This means that trips involving a transfer will actually be cheaper with a regular TAP card ($1.75) than with a student TAP card ($2.00). Is there any way that a student can possibly get the cheaper regular fare with his/her student TAP card? Or would a student need to carry an additional regular TAP card to avoid paying 25 cents more than adults? The latter option seems rather byzantine. Excellent point. I don’t know the answer off the top of my head — but we should have a post relatively soon with all the info about the new fare structure. No need to have Metrolink even operate on this corridor anymore with HSR. They should shut down the Antelope Valley Line or at least end it at Santa Clarita once HSR is up and running. Service can be added on other lines instead or the stub line. Another question about backtracking: suppose I take the Blue Line from Long Beach to Pico, and then tap at Pico. If I board the Blue Line back to Long Beach then it’s a round trip, but if I board the Expo Line to Culver City then it’s a one-way transfer. How will TAP know whether to deduct an additional fare? If it helps Angelenos as far as the upcoming fare increase, in NYC the MetroCard offers a free 2-hour transfer as long as it’s not on the same bus route. It CAN be valid for a round trip if going from A-to-B by bus and B-to-A via (a) train or (b) a different bus route. LA example: DTLA to Koreatown via Purple Line then return trip on bus 20/720. The one suggestion that I would recommend is to have the entire rail system one fare. As it seems to be right now, a ride from, e.g. Red Line to Blue Line to Green Line is THREE SEPARATE FARES. If there was a way for Metro to make most, if not all, interchange stations (Union Station, Metro Center & Willowbrook) be free transfers, then I believe more commuters would take the train more often. Having said thay it’s a good start & I’m rooting for y’all at Metro. In NYC, I should also add, there’s no free transfer from subway-to-subway with the exception being the 59th Street/Lexington Ave station complex (4, 5, 6, N, R, Q) and the Lexington Ave/63rd Street Station (F). It’s similar in Chicago where there are two designated subway-to-subway transfer stations. If the transfers involve “one-direction,” can I use the Metro Bus 720 at DTLA, get off to do some grocery shopping along the way, and get back on another Metro 720 bus so long as it’s headed in the same direction? This whole thing is becoming needlessly confusing with too many exceptions. I’m too beginning to think that charging by distance is a more simple solution. What works in NYC is not going to work here. NYC Metro only covers the main part of NYC which has a population of 8.4 million in a small area of 468.9 square miles. LA Metro OTOH, serves all of LA County which has a population of 10 million in a vast area of 10 times as NYC at 4,500 square miles. What LA Metro should be doing instead is looking at cities that have similar characteristics as LA: a large population in a widely spread out area. In that league, LA has more in common with metropolises such as London, Seoul, and Tokyo than NYC. In Korea it’s much more easier. You load up your T-Money card with whatever money you want, you tap-in when you enter the station and you tap-out when you exit the station. Fares are deducted automatically based on how many stations you traveled through. Oh, did I mention the money put into the T-Money card is accepted as a debit card so you can use it to buy stuff at convenience stores and such, unlike the TAP card which you can only use for Metro? There’s no need to remember all these ifs and buts or think in advance what’s a better deal or the number of passes or memorize all these confusing transfer rules. Why can’t Metro learn from Korea? All they have to do is ask around the Korean-American population that lives here and there’s plenty of them here in Los Angeles! Is that so hard to do? Ron brings up a great point, and it highlights the intense confusion caused by all these *exceptions* to the free 2 hour transfer – if you take Blue from Long Beach to Pico or 7th St/Metro Center, you can easily tap again for your next rail line, but how will Metro determine which one you take next? If you take Blue again, suddenly you’re in violation of Metro’s yet-to-be-released rules that prohibit a roundtrip on a single fare. But if you take any other rail line or bus line, you’re not. So how will Metro determine which line you actually take next, and how will TAP know when to charge you again or not? It seems like Metro should just follow New York’s rule and get rid of all these proposed restrictions. Just give the people 2 hours to travel in any way they want. It makes the system much more simpler to use and it *Encourages* ridership! No need to nitpick with all these ridiculous exceptions that will only frustrate riders and turn people off to transit altogether. If the 2 hour free transfer causes too much loss to the agency, just increase the price to $2, with no restrictions on transfers. Fact: Sixty percent of transit riders in Los Angeles are below the poverty line, who live in apartments and do not travel that far to work. Raising the fares to $2.00 only hurts the most vulnerable of society. This was one of the key important issues raised by Supervisor Molina during the fare hike debate at Metro HQ earlier this year. As such, all future fare hikes are now on hold and the Metro Board has instructed Metro to look at ways to cut back on wasteful spending instead. Yes let’s all pay $2 whether you go from a few miles from Wilshire to Normandie or you go from North Hollywood all the way to Long Beach. That’s really a way for Metro to make any money. NOT. No wonder all the smart jobs are being taken over by us Koreans and other Asians and that we have way better public transit systems that you could only dream of. You guys are total amateurs in this world. You will be better off selling Metro to Koreans.